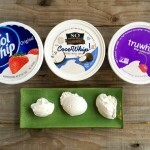 I admit it: I like Cool Whip. Always have. When I was a kid I didn’t even need an excuse to eat it, like on top of chocolate pudding or a bowl of fresh strawberries. I’d eat it straight out of the tub with a spoon. (I can see a few of you nodding in solidarity.) As an adult, I still like it, but my criteria have changed about how often I’ll allow myself a big white blob of it. Does that mean I’ve decided it’s a bad food? Let’s just say with time and age come wisdom and I think there are some better choices out there. I also think we like to categorize stuff. And we like it when the decision is easy and clear, like when things are black and white. We like to know if something is good or bad, cold or hot, paper or plastic, smooth jazz or crunk, so we can compartmentalize it in our mind. A little gray area really messes up our system of choosing, and food is no different. But with nutrition very, very few things are black and white. In most cases, the answer depends on several considerations, like your personal goals, your health status, your allergies, your budget, your taste preferences, etc. In other words, the answer for you might be different than for someone else. I find that when people ask me if a particular food or beverage is a “bad” choice, the best way to answer is using the idea of a continuum. That way we can compare options and nudge ourselves in the direction of maybe not a perfect choice, but a better choice. A good example is oatmeal. If my husband asked me if instant oatmeal was a “good” choice for him for breakfast, I’d say no. He currently either eats old fashioned oats or whole oat groats, so the more highly processed instant oatmeal is moving in the wrong direction. But for a friend who currently skips breakfast or has only coffee, instant oatmeal is a great step towards getting a whole grain in their bowl and their belly. So I’d tell them it was a good choice…to start anyway. Possibly, hopefully, after a series of small improvements over time, they might eventually end up at the other end of the whole grain oat spectrum. Because it’s December 23, which falls smack dab in the middle of pie and dessert season (and not oatmeal season), today’s continuum topic is instead whipped cream. Is it “bad” for you? Well, it’s primarily fat and sugar, and it’s kind of an “extra” food that doesn’t provide a lot of nutrition, just delicious calories. But you might be able move yourself along to a better choice. 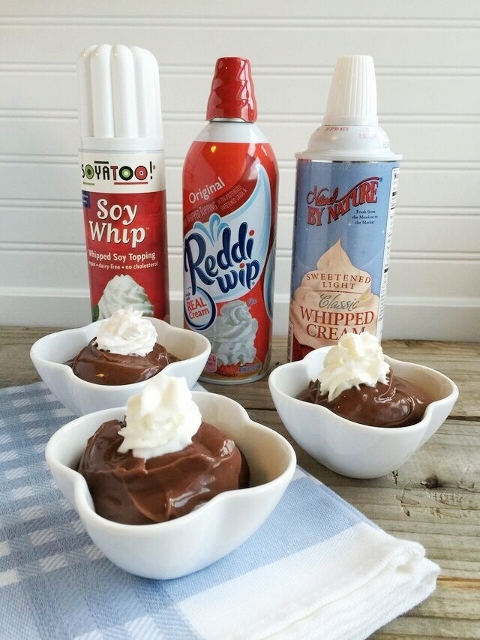 Let’s look at the alternatives: whipped toppings in tubs, whipped toppings in spray cans, and homemade whipped cream. Let’s take a peek at the nutrition facts side by side. These would be a step up from the tubs I think, just because they’re predominantly made with actual cream, milk, or soymilk. They’re not perfect, of course, but possibly a few steps towards the “better” part of the continuum. 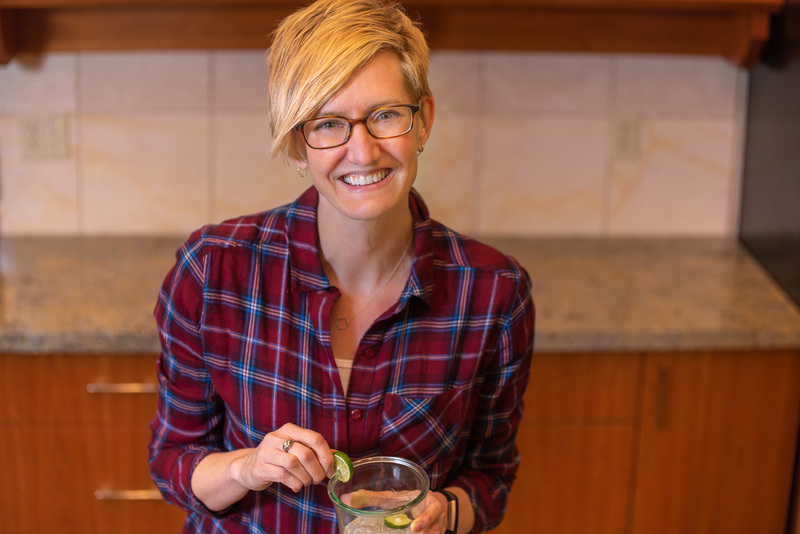 There’s not a huge difference here when we compare nutrition facts, though the slight variations would be magnified as the serving sizes got larger than 2 tablespoons. I think the difference in calories between the spray cans and the tubs has to do with density. If you look at the gram weights for 2 tablespoons, they vary, likely because the spray cans offer up more air. Even though it may feel like you’re comparing apples to oranges for calories, etc., I think it makes sense to use the standard serving size on the label of 2 tablespoons for all the products since most of us decide on our portion visually, which is based on volume rather than weight. For the spray products, I guess I might nudge someone towards the one made with organic dairy over the non-organic for a slightly better pick. Vegans and folks avoiding dairy will appreciate the soy version, and as you can see, the price difference is significant which is another consideration. 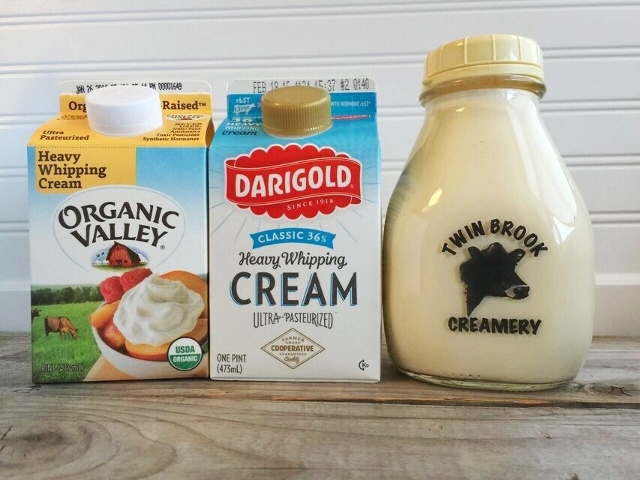 Interesting to note: only Twin Brook Creamery uses just cream. The other two companies have additives that probably make for a more stable end product. 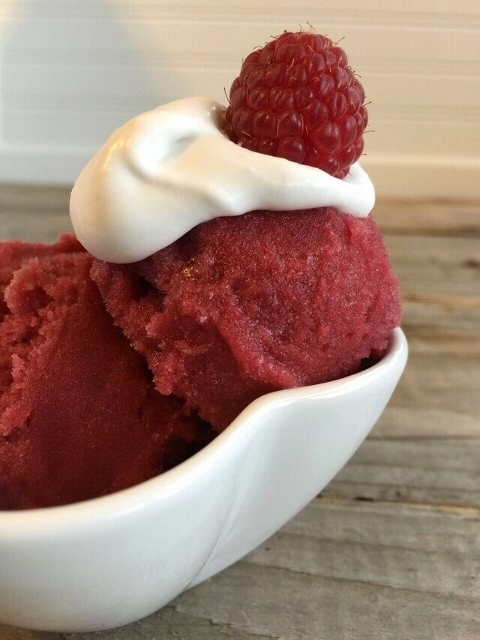 Raspberry sorbet with coconut whipped cream. 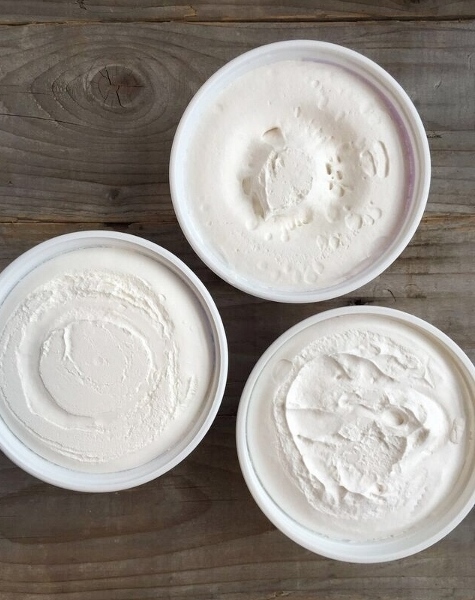 Making homemade whipped cream takes a little more effort than pressing the spray button on a can or scooping a heap out of a tub. But if you don’t want to get out the cold bowl, the cold beaters, and whip it good, there is a shortcut: whipped cream dispensers. Mine’s from iSi and it uses little nitrous oxide cream chargers for each batch. I can have fresh, thick peaks of cream within about 2 minutes of pulling the stuff out of the refrigerator. 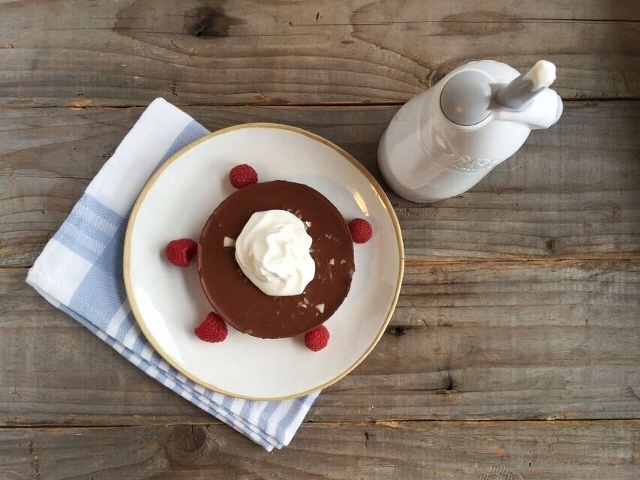 A chocolate coconut tart from my local food co-op, topped with real whipped cream made with my iSi dispenser. Keep in mind too that there are also low fat, fat free, light, skinny, chocolate, etc. versions of all of these products which would fall somewhere in between the spots we’ve established on the continuum. At the very least, I think we’ve determined that there are plenty of possibilities to choose from. So, what’s the conclusion? Well, it depends. 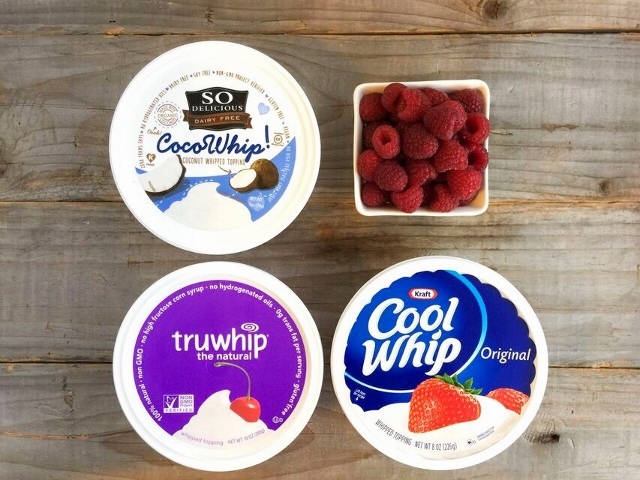 If we’re striving for more whole foods and real foods, which I think is the goal for most of us, I’d probably go with the coconut milk or plain old fashioned whipping cream. But if I was really short on time, needed the stuff to hold up as we drove across the state to Grandma’s house, wanted it to last the whole rest of the holiday season in the fridge, felt like experimenting with a new product, had a 2015 New Year’s Resolution to prioritize organic foods, or was trying to accommodate someone with a food allergy or special diet, there are all kinds of other available options. And of course, we can’t forget about taste. All of the choices we looked at here have a slightly different flavor profile (and texture) so that may be your ultimate deciding factor. In reality, this is the reason any of us deign to cover our cobblers, ice creams, parfaits, and taste buds with the white stuff, in whatever form, in the first place. What products did I miss? Do you have a favorite white creamy topping that makes an appearance around the holidays? *I don’t think they mean coconut extract like the liquid flavoring, since that’s not how you make coconut milk, and the nutrition facts wouldn’t match up if it was a can full of water. I think they mean flesh extracted from a coconut.